Been intending to post this for a while now. The purpose of this blog is to chronicle my journey as a priest. And, well, the journey continues. I will be transitioning shortly from rector of St. Paul’s in Yuma, Arizona to Vicar of St. Thomas of Canterbury in Temecula, California. What follows is a compilation of three newsletter articles I recently wrote to introduce myself to the new congregation. With some work yet to do in Yuma and other scheduled obligations, it will be some time yet before I am at the helm in Temecula. In the meantime (the June and July newsletters), as a way to begin our relationship with each other, I’ll tell you my story. How’d I come to be Vicar of St. Thomas of Canterbury? 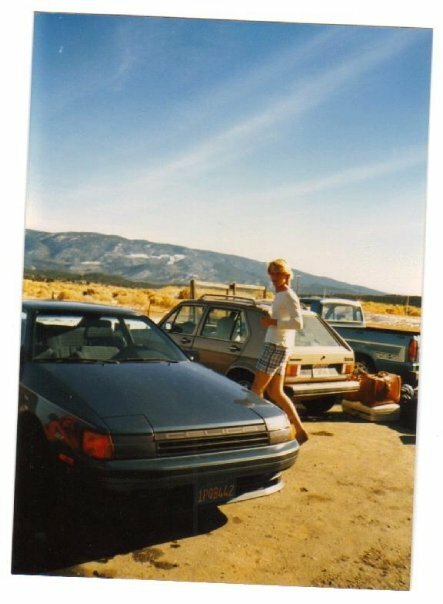 Growing up with an avocado orchard on the outskirts of Camarillo, California, my childhood was ideal in many ways. This was the day of no seatbelts or bike helmets, and even though video games were just coming into their own with companies such as Atari and microwaves and VCRs were all the rage, the pull of year-round spring-like weather and a couple acres was a strong enough lure to keep me outside most hours—when I wasn’t preoccupied, that is, with the obligatory homework and piano practicing. Scouts, soccer, the neighborhood gang (20-ish kids within a 3-year age span), and my dad’s unquenchable thirst for adventure rounded out these formative years. Family meant everything to me then. Church, however, was not a part of these idyllic times. Not sure you could call us Trues atheists back then; God or no God, we just tried to figure out life on our own. My parents’ divorce changed all that. I was in middle school. My older brother and I would remain with Dad, it was decided, while Mom pursued her new life. Suddenly, family no longer meant everything to me. How could it? It was no longer together. My rock, my foundation, had been pulverized. And thus began my search for new meaning, new hope, new salvation. Occasional visits to campus Bible studies turned into regular visits turned into a ski-trip conversion experience turned into baptism and church membership. By now I was in college, trying to figure out what I should be when I grew up, involved in college Bible studies and ministry leadership and, during the summers, program work at a large Christian camp. College is where I met Holly, my future bride. We studied music and sang in the university choir together. We both attended the same church. This running in the same circles continued for a year or so until I finally got the nerve to ask her out on a date, which turned into another date, and another, and so on, until we married, me fresh out of college, her with a year to go, on Sept. 11, 1993. September 11th was our anniversary first, by the way. Anyway, back in college, back when I was thinking about what I should be when I grew up, the idea of vocational, ordained ministry was a constant. I considered other options, sure. But this idea I couldn’t shake. So I prayed about it. A lot. And I talked with Holly about it. A lot. No wonder, then, that my first real job was as Director of Youth Ministries at a Baptist church. Now, remember, I hadn’t attend much church before college. The idea of vocational ministry in my mind mostly looked like parachurch Bible studies (think Young Life, if you know what that looks like) and summer camp. Youth ministry in a Baptist church confronted me with messy things I’d never thought about before, like a board of Christian education: a committee that was effectively my boss. Long story short, three years there was long enough to convince me I wasn’t a Baptist. The strong, internal sense of call to ordained ministry remained, sure. But as for which denomination, tradition, or perspective, I was befuddled, perplexed, and nonplussed. I retreated into working other jobs—teaching mostly, but also some engineering and music directing and accompanying. I had bills to pay, not to mention an increasing number of family members to support. 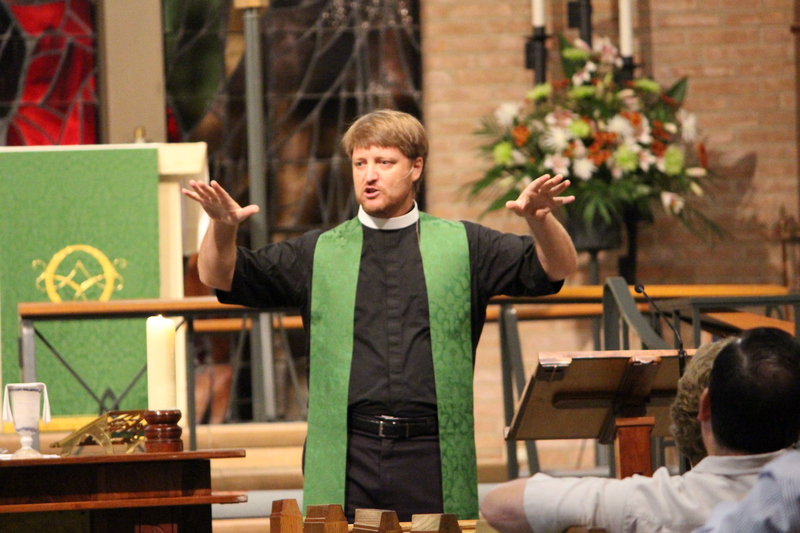 Some twelve years passed—and in that time we passed through some churches and denominations, from Baptist to Presbyterian to Episcopal—until we found ourselves with our four daughters settling into St. John’s, New Braunfels, in the Diocese of West Texas, drawn to the Episcopal Church by its sacramental theology and its appreciation of and respect for liturgy and music. And I be like, “What? No way! You can’t do this! This is my spiritual home! I can’t even!” Etc. So I wrote a deeply thought out and probably passionate letter to my bishop expressing my frustration and my long-time desire to be ordained, and wouldn’t it be especially helpful now! And my bishop replied, asking me to meet with him for a one-to-one conversation. I’d only ever met him once before, when he confirmed me. So I didn’t yet know him or what he was like—his personality, his ministry point of focus, and so on. Turns out he was very intent on future generations. Youth and camping ministries were key for him. So was providing priests for the next generation. And that was that—for the time being anyway. But a year later we revisited the conversation, this time with Holly joining. Baby #5 was about to join our family, so we decided to table the idea for one more year. And then, in early 2010, it was decided: we Trues would relocate to Sewanee, Tennessee for three years. Somehow, we were determined, it would work. The three years in Sewanee were tremendous. It is the home of the University of the South, the only university still entirely owned by the Episcopal Church, which houses a liberal arts college and a seminary. We Trues jumped in with both feet, immersing ourselves in all we could. The seminary community is just one facet of this diamond, a fairy-tale town perched atop the Cumberland Plateau. Our kids went to school and played sports locally. Holly worked odd jobs around campus, including Wedding Hostess of the beautiful All Saints’ Chapel. We dined regularly at university and town eateries. I taught two semesters of Latin to undergraduates; took elective courses through the college; learned the carillon and became Assistant University Carillonneur; and worked as an organist at local churches. Sewanee became a real home. (Indeed, our oldest daughter, who graduated from the University in 2016, had spent a full third of her life there by that time!) Perhaps more than anything else, my time at Sewanee taught me to see the Episcopal Church truly as a nation-wide organization. Ordination to the diaconate came for me on the Feast of the Holy Innocents, December 28, in 2012—back in Texas, over Christmas break. The Episcopal Church requires every priest to serve as a deacon for at least six months prior to priestly ordination. My bishop thought it would be a good idea to spend my last semester in seminary already ordained, to gain some working knowledge as I finished my time of focusing on the theoretical. A good idea, I agree, having experienced it! Priestly ordination followed on July 7, 2013. Graduation took place in May and I began serving as a curate in mid-June at St. Luke’s Episcopal Church in San Antonio, one of the largest parishes of the Diocese of West Texas. The position of curate is designed to get one’s feet wet, so to speak. Curacies generally last a couple of years, equipping new priests with tools to carry into future positions. With my previous life experience in religious education leadership, not to mention some twenty years of following the call into ordained ministry, I was eager for these two years to pass and get on with serving Christ as a rector already. So, eighteen months into it, happy for my time in San Antonio and forever grateful to the Diocese of West Texas for confirming outwardly my longtime sense of internal call, I began looking westward, where I could still be a part of the nation-wide Episcopal Church and also be nearer to where my aging parents live and to the home of my own childhood. That new call soon materialized: St. Paul’s Episcopal Church in Yuma, Arizona, in the Diocese of San Diego. Now, some two years hence, I can say that challenges and rewards at St. Paul’s have been many—some anticipated, others unlooked for. Working knowledge and the experience that comes with it are invaluable. And so here I am, facing another move, ready to live into the new challenges and rewards that will come in Temecula, more prepared than ever before but knowing that we can never be fully prepared, looking forward to doing great things together for Christ in the Temecula Valley. It is with much joy that I write to you, eager to enter your fellowship and navigate the waters of ministry with you into our future together. Some months ago I received a phone call from Bishop Mathes, in which he asked if I’d be willing to put my name in the vicar search for St. Thomas’. “As I’ve gotten to know you,” he said, “I’ve come to believe you have the gifts and talents that most align with what St. Thomas’ wants and needs for a leader. Tim, I think you’re the man for the job; I think you’d be a great fit.” Of course, I said to put my name in the pool—this was the bishop calling, after all. I then began to do my homework. And as I did so, the question to frame my analysis was, what is it about me in particular the bishop sees? Here’s what I’ve assessed thus far. Especially exciting to me is your music ministry. Music, especially in the Anglican choral tradition, has played no small role in my own spiritual journey. To work with accomplished musicians in order to craft effective liturgy is a thing I’ve longed for in recent years. I’m also eager to establish and develop a strong working relationship with the day school, its board, director, staff, and families. Prior to ordination I was a career teacher in private parochial and independent schools, experience that should go a long way in a school/church relationship. Along these lines is Christian formation. A lifelong learner myself, I look forward to strengthening the already strong Christian education program for all ages. And as for the location! It’s no secret that Temecula is beautiful, nestled between the California coast and desert, a perfect opportunity to exercise hospitality. Focal points of ministry for me are music and liturgy, preaching, teaching, and formation. I consider my leadership style to be flexible yet organized, collaborative, and innovative, willing to go in new directions when old ones tire out or fail. Maybe I’m more an artist than a scientist (more a Greek than a Roman), though I believe the two are not mutually exclusive. For fun I like to hang out with my family, cooking, eating, playing bridge, and walking our 12 year-old Labrador, Arwen; and, as I’m able, I like to hike, compose, write, and ride my motorcycle. Put these together and it’s plain to see that, as the bishop stated, here is a great fit! Please pray for me and my family in the months ahead. Moving from Yuma to Temecula will not be our only transition. Back on August 8th I announced via this blog that I would be enjoying a fellowship-in-residence for almost two weeks in Sewanee, Tennessee, care of the University of the South’s School of Theology, my alma mater. It wasn’t to be what one might consider a typical fellowship awarded from a seminary, to research and otherwise work on some translation of a desert father or some such. Don’t get me wrong. This type of fellowship has its place. Mine was an unusual proposal: to study Sewanee ghostlore and work on a piece of fiction set in and around Sewanee. You see, Sewanee ghostlore was something that always intrigued me during my three years as a resident there. But I never had the time to get into it. I was studying to become a master of divinity, after all, which meant (with five kids in tow) I also had to be a master of time management. But this fellowship should give me some time, I reasoned. Twelve days, to be exact, to focus on the shadowy side of Sewanee. The timing helped too: Halloween was smack dab in the middle of the fellowship. So I wrote my proposal (some time ago) and followed up and begged and followed up some more and pleaded and followed up some more and wheedled and whined and followed up some more and, lo and behold, they awarded it to me. And it was everything I’d hoped for. It gave me nearly two weeks to wander the campus, interview long-time residents, attend special lectures, hike the perimeter trail, enjoy meals with friends and family (two of my kids attend college there), watch some scary movies, and write, write, write. I came home with 20,000 words of a first draft and an outline–should tap out at about 60,000 words–and hopefully enough momentum to continue the discipline in order to have a first draft by spring. It was October 30, nearly midnight. I was attending a telling of Sewanee ghost stories in an old building on campus, the library archives building. One of the librarians who was well-versed in Sewanee ghostlore started out. We learned about the Perambulating Professor, an apparition who will join folks walking after dusk on Tennessee Ave., sometimes with his dog. We heard accounts of the McCrady woman. McCrady is a dorm. Apparently several people–students and staff alike–have encountered her, always in a purple dress with long brown hair, wandering the halls. And we discovered that there is an unpredictable poltergeist in another dorm, Tuckaway, who slams doors and opens windows and has even locked a student in his room for several hours–despite substantial efforts to unlock and even unhinge the door! Then she told us about the very building in which we were seated, about twenty-five of us. Sometimes the stairs would creak as if someone were walking up them even though no one was around. By now it was well after midnight and, okay, I’ll admit it, we were a little spooked. The librarian asked us if we knew of any stories. A few personal experiences were shared, thus intensifying the spookiness some, sure. But I didn’t want the night to end. I mean, I had to walk back across campus, after all. DARK parts of campus. Let’s keep it going, I thought, just a little while longer. And, “Oh my gosh!” a girl two seats to my right exclaimed. And this girl, who’d not said a word all night, began to relate her experience with big, big eyes and lots of body language. And she went on, telling her story, animating it with big freshman eyes–full of adventure and wonder–arms and hands waving and flailing, to get her point across; and–just when she was in the height of the suspensefullest part–she took a breath–to reload–and just as she took a breath–we all heard it–a low, loud growling sound came from underfoot! She never finished her story. Instead, like a clap of thunder, the whole room collectively screamed and slammed their hands down on the big table we were all sitting around, to push themselves up, grabbed their backpacks and purses and began sprinting pell-mell for the doors! And I threw my head backwards and laughed out loud until I saw stars. This was definitely worth the price of admission! Well, yes, the mayhem ceased. But within five minutes we’d all dismissed ourselves and were on our respective ways–students to their dorms and me to my room in the Inn, across dark parts of campus. I must say, though, that I was laughing too hard all the way to my room to be spooked. Anyway, the fellowship was wonderful! I’ll keep you posted as the book progresses. In 2008 I had the privilege of meeting Dr. Jeremy Begbie. 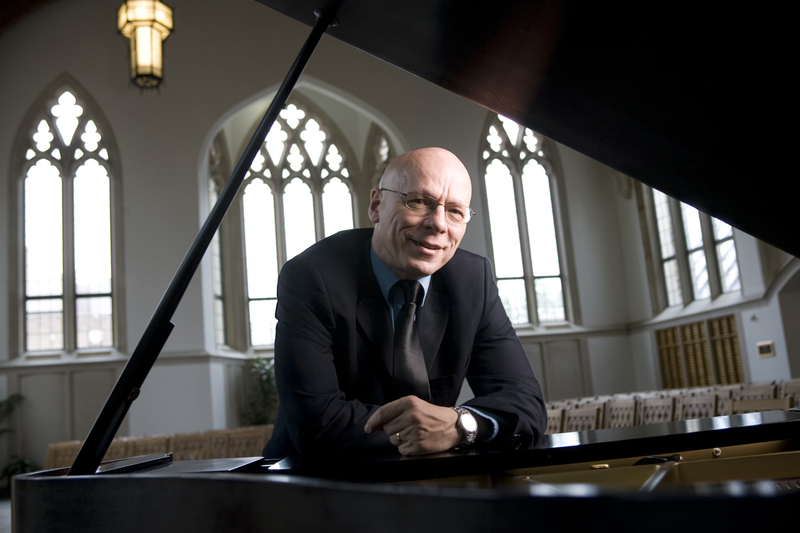 Back then he was transitioning from a position with St. Andrew’s University in Scotland to a newly created post with Duke University; from founder and director of the Institute for Theology, Imagination, and the Arts at St. Andrew’s to founder and director of Duke Divinity School’s Initiatives for Theology and the Arts. And that’s only what he does for half the academic year. The other half he teaches systematic theology in Cambridge, England. Begbie is a prolific writer and sought-after speaker, a trained classical pianist and priest in the Church of England. 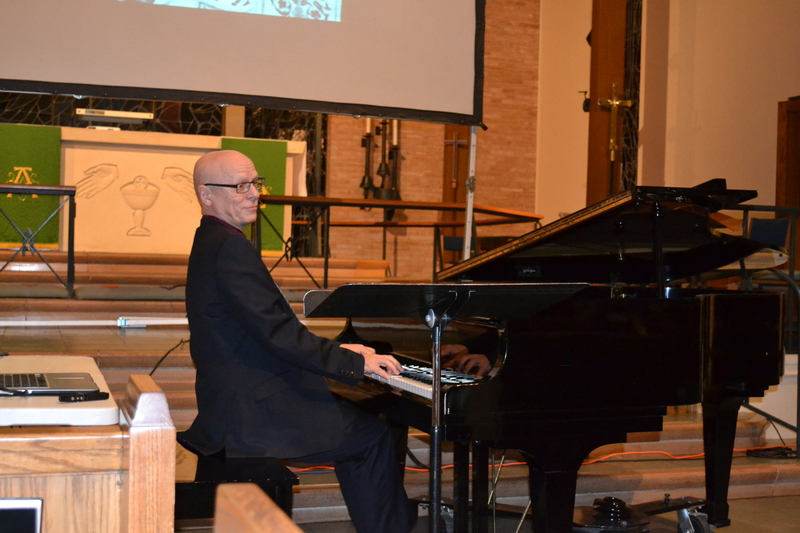 He has devoted his professional life to exploring the intersections of theology and art, especially music. I’d been drawn to the Episcopal church in large part because of its rich liturgical and musical traditions. And now I was reading a book of his, in fact, when I heard he was coming to a conference being held just up the road in Austin, Texas. “Can I go?” I asked my boss as I showed him a flyer. “I wish I could join you,” he smiled. So, the conference did not disappoint. Begbie is an academic. So you might call to mind the stereotypical academic lecturer: dry, inaccessible, interesting only to the few other academics in the world who share his esoteric questions. Not so with Begbie! 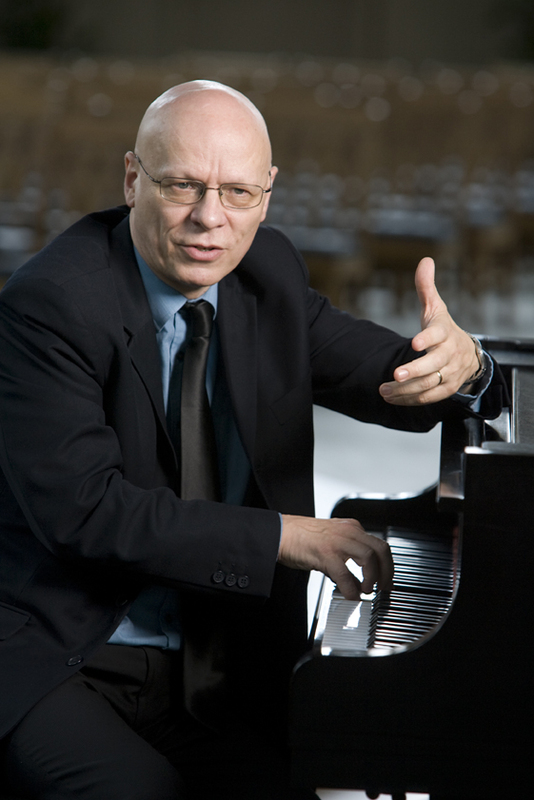 I witnessed him teach a room of six hundred people–mostly non-musicians–how to listen for God in a piano sonata by Sergei Prokofiev. Prokofiev’s music isn’t easy even for musicians! After discussing, Begbie performed the piece; at its conclusion, all six hundred listeners instantly rose to their feet as one, responding with loud ovation. Non-musicians had heard this difficult piece of music and they got it! They encountered the divine in and through Prokofiev. Since that time I’ve read more of Begbie’s books; I’ve looked wistfully at Duke Divinity’s website, wondering if I might be able to enroll as a doctoral student with its Initiatives for Theology and the Arts; and I’ve tried to book Begbie for speaking/performing engagements. The world, especially the Episcopal world, needs to hear what this guy’s about! As I said, I was drawn to the Episcopal Church in large part by its musical and liturgical traditions. So much of modern-day Christianity is lite, as in lite beer (which is even lite in the way it misspells light). Maybe another way to say it is user-friendly, to put a positive spin on it. The bar is low. Pew sitters don’t have to do much except show up on Sunday expecting (and usually getting) a sort of cheap and uplifting entertainment. But as a person with a bent towards the spiritual, a few years of Christianity lite was already too much for me. I didn’t want to come to church on Sundays in search of uplifting entertainment in exchange for a few bucks in the plate as it passed by. I wanted to encounter God. If it took a little or a lot of effort on my part to do this, so be it. Besides, if I was in fact entering God’s house every Sunday, as we Christians in fact believe; and if I was in fact dining with Jesus Christ at his very Table–also something Christians believe–then why shouldn’t it require a little effort on my part? I wouldn’t show up to a dinner with the president of the US in flip-flops, shorts, and a tank top; why then show up to church like this? Take this line of reasoning beyond me, as an individual, to the us, the corporate body we call church, including the many centuries of worshipers who have lived and died before our time. These usses have taken the faith seriously. The music and liturgy reflect this. There is something profound in praying the same Eucharistic prayer prayed by the English saints of the sixteenth century. Similarly, music. Think about all the complexities of a pipe organ and a many-voiced choir versus the simplicities of some soloist performing with a six-stringed guitar and a microphone. Not to slight the latter over the former, especially in its rightful context. But which seems more appropriate for a royal banquet? Sadly, though, American Christianity is losing interest in the complex musical tradition in favor of user-friendliness. And thus we have Christianity lite. And it’s not just the non-denoms and so-called evangelicals. It’s Episcopalians–who ought to know better; who ought to treasure their tradition the most! Instead we look over the fence. At least that’s been my experience thus far. And I’ve only been an associate, not yet a rector; so thus far I’ve been powerless to effect change here–except for a recent Begbie event, which I’ll get back to soon; but here I had to circumvent my position as curate and deal with it at the diocesan level, a kind of clever subversion. But I digress. Point is, we Episcopalians look over the fence at those other guys, those “successful” ones who somehow manage to bring in the numbers (and the pledges). And we think, how can we be more like them? And so the traditions we look to (if one can even call them traditions), congregational growth models from the 1990s mega-churches, are anemic and insipid, like so much schmaltz; and they end up trumping centuries of balanced nutrition. In the middle of May, 2013, I was in San Antonio looking for a house to rent. I’d just graduated from seminary. A diocesan retreat would be happening in a few days. Knowing I was to begin working at St. Luke’s in June, in the mean time I thought I’d try to find a place to live. So, motorcycle helmet in hand, and helmet hair on head, I crashed the LMC meeting. Planning an event was on the agenda, one that was somehow related to liturgy and music but also would be accessible, not just for choirs and their directors. “Why not Jeremy Begbie?” I suggested. “Who?” the other LMC members replied. By the next meeting–now I was wearing clericals and living in a house in San Antonio–we had learned that Jeremy Begbie had a free weekend early in February, 2015, and could we get a proposed event on the calendar? And since I had brought it up, and since I was now working at St. Luke’s, a sensible venue, wouldn’t St. Luke’s like to play host? And so that was decided too. Which really meant, as I learned about three months ago, that I would end up doing most of the work, like when one kid ends of doing ninety percent of a high school group project. So, remember that part where not too many people care about our rich liturgical and musical traditions anymore? That idea became reality about two months ago. For three months ago we opened registration for the event. And by two months ago only a few people had signed up, a few who all happened to be affiliated with the LMC. Clergy were roused. Emails were sent. Phone calls were made. Then, one month ago the number of registrants came in at a whopping nine. Now, Begbie’s requested fee is $2000 (all of which, by the way, he puts into the Initiatives at Duke) plus travel expenses. We were charging $35 a piece at the door; $25 for early, online registration. We had only $1000 in the LMC account. Do the math. A month ago we were in trouble. But I believe in the guy’s message. And I also believe that the church is losing sight of its traditions. So , like that parable where the wedding guests ignore their invitations, I took what good news I had to the highways and byways. I began to contact everyone I could think of within a 200-mile radius who might have the slightest interest in Begbie. Fortunately I vaguely remembered the name of the group who sponsored the Austin conference from 2008. It had the words Hill Country in its name; and the conference was something about transforming culture. And with some weird combination of luck, providence, and Google working in my favor, I found it: Hill Country Institute. 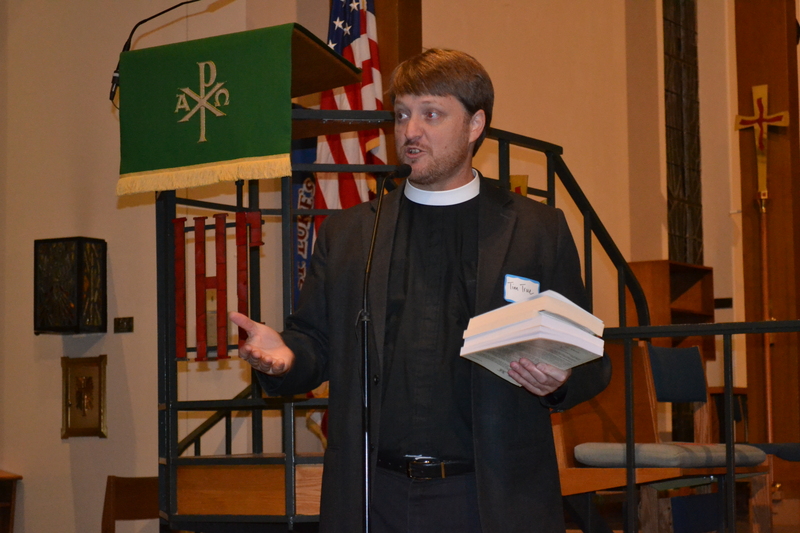 Well, between HCI and the forty or so other contacts I made on a certain Friday night between 7pm and midnight–as if I had nothing better to do!–we saw 85 actual people show up to this event, about twenty who were not Episcopalians. In fact, we almost covered costs, meaning most of that $1000 is still in the LMC bank account. And my smile’s been huge for the last five days. HCI gets credit here because, yes, it knows and loves Jeremy Begbie; and it spread the word to more than 5000 of its constituents; and it interviewed Dr. Begbie and aired this interview a week ahead of the event on a radio program that covers much of south Texas via its airwaves. HCI, at the last minute, became a solid co-sponsor; no doubt many of those 85 are a direct result of HCI’s efforts. Thank you! Still, only 85? What’s wrong with our culture? The event itself was glorious. Dr. Begbie was as good as I’d remembered, even better. As for a review of the event, watch for another post soon! The nature of the job being what it is, sometimes I have to travel with my collar on. Which generates funny looks and reactions from people in the airport. Most betray shifty eyes. Right? I sense someone looking in my direction, you know, like we all do from time to time. I’m not trying to be tacitly confrontational or anything. I just sort of have this sense that someone’s stare is coming at me from two o’clock. So I glance that way only to see a pair of eyes quickly avert to nothing in particular, just this or that, anything but eye contact with the man in black. Then there are others, like the four-foot something Latina who asked me if I could lift her bag into the overhead bin. No problem. But then to express her gratitude she went out of her way to say “God bless you” more than a few times throughout our 49-minute flight. So, point is, people look at me much differently when I travel with my collar on than when I wear, say, blue jeans and a button down, like I will tomorrow when I come home. So there I am, sitting in the airport, near my gate, waiting for ten or so minutes until boarding begins, noticing shifty, averting eyes here and there, all the while feeling increasingly like a side show at a circus of yore, meaning my grumpiness meter is rising, at least a little–got the picture?–when one of those announcements comes over the loudspeaker. And I’m thinking, okay, something’s up. Usually the Voice of Customer Service, the VCS, whether male or female, doesn’t preface an announcement with listen up everybody. And usually most airport waitees don’t listen, or only half-listen, from my experience anyway. So, being in a line of work that values communication, I begin to wonder, curiously, if this announcement tactic is working. 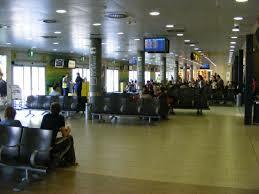 And I begin to look around the crowded airport room. Eyes avert my gaze seemingly everywhere, like rapid fire but only inverted, which suggests people are more intrigued by the side show than anything the VCS has to say, even when prefaced. But then I see a guy almost directly across from me actually staring into the air with a look on his face that tells me he is in fact listening intently, yes, to the VCS. Which caught the man’s attention. Who looked in my direction. Mine, the grumpy side show with the collar. But no way was I going to avert my eyes. I wouldn’t stoop so low. Then, obviously registering Ping and Pong, he looked backed at me and, like a game of Ping-Pong, let out a guffaw as well. About then I noticed that no one else in the airport was sharing our joke. Either they hadn’t heard (most likely) or (less likely) they hadn’t seen the humor in it. Now eyes were on both of us, this corporate side show, which frankly gave me a case of the giggles. Which affected my newly found friend, who caught my contagion. And now I had to look away. Him too. For if we looked up and happened to catch one another’s gaze, the case of the giggles would strike us again. Which we did. Several times. Until I had to board my plane. And which, I’m sure, added to the side show aura of traveling with a collar on. Earlier this week I had the tremendous privilege of attending a preaching conference. I’ve attended conferences on preaching before, sure. But this one was different. Five of us–all priests of some sort of Anglican stripe–got to hang around one of the world’s most respected preachers for three days. 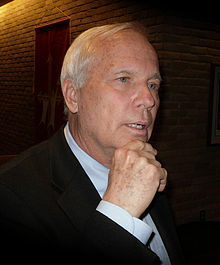 That preacher was Will Willimon (pictured below), sometime United Methodist Bishop of Alabama and present professor at Duke University’s Divinity School. The format was simple. We each came to present and discuss two sermons. An hour was given for each. We’d listen as the presenter preached; then we’d discuss, critique, etc. for the remainder of the hour. While not a requirement, my first sermon I’d already prepared and given elsewhere. The other (for me) was to be a work in progress. That is, my plan was to take time on Tuesday afternoon and evening, during some allotted free time, to write a second sermon, which I would then present on Wednesday morning in almost final-draft form. Such was my plan anyway. What actually happened was the three hours of free time Tuesday afternoon turned into an hour because of lunch discussion and ensuing conversations. And the five or so hours I had set aside on Tuesday night turned into a gouda-mushroom buffalo burger, two pints of a local (to Dallas) craft porter, and conversation with my new best friend Lawrence, a priest from the Episcopal Diocese of North Carolina; leaving me with only two or so hours to create (which I turned into three by staying up an extra hour, till midnight). By work in progress I don’t mean lack of length. I had about 1,200 words, or 13 or so minutes of speaking (normalish length). But I’d been dealing with two pretty substantive themes, both which should have their place, I’d rationalized, but was having trouble connecting them. Etc. Anyway, after my initial qualifications and run-through of Sermon 2, coupled with the feedback I’d already received from canned, preached-without-a-manuscript Sermon 1, the insights I received were invaluable. I give you three that stick with me. Yeah, I was thinking, tell me more. Implication: what I said was lost in presentation. Ugh! But, really, it’s so true. He told me this just after I’d preached Sermon 2, which really did come out as kind of a mess. The themes were disjointed, for one thing. Point taken. Clarity and concision are super important. By the way, as I sat in the airport for two hours on Wednesday afternoon I revised this yet-to-be-preached sermon, starting by keeping the first third of my manuscript and deleting everything else. I’m taking Willimon’s advice and developing only the first, strong theme. I’ll save Theme 2 for another go around, next Advent maybe. The second insight in fact comes from a theme that kept surfacing throughout the three days, culminating especially during a breakfast I enjoyed on Wednesday with Willimon himself. Four of us were staying in the same hotel, which included an excellent breakfast (shout out to the Holiday Inn on SMU Blvd. ), and as I exited the elevator, lo, there was the guru himself, sitting at a table by himself. For my part, I didn’t even ask permission; I just sat down next to him and invaded his space. He seemed okay with it. Southern politeness maybe. The third insight struck me like an epiphany. This is what I needed to hear more than anything else all week. And the coolest part is (because it shows how important collegiality is), it did not come from Willimon but from two of the other priests (albeit with Willimon chiming in). These priests, I should add, (like Willimon) are seasoned teachers as well as preachers. One is presently a seminary professor and the other has ten years’ seminary teaching experience. So simple, but I’d never thought in this way before. So now I’ve got a new goal in my sermons. They’re not after relevance, an application for today, or increasing in knowledge and/or wisdom. These things have their place; and they will often happen in sermons, sure. But more important is the encounter with the divine–just prior (in Episcopal liturgy) to joining Christ at his Table for Communion with God and neighbor. Footnote: if you’re interested to see what my attempt at sermon-for-encounter looks like, stay tuned. I will post my sermon (in manuscript form), the byproduct of this conference, on Sunday.